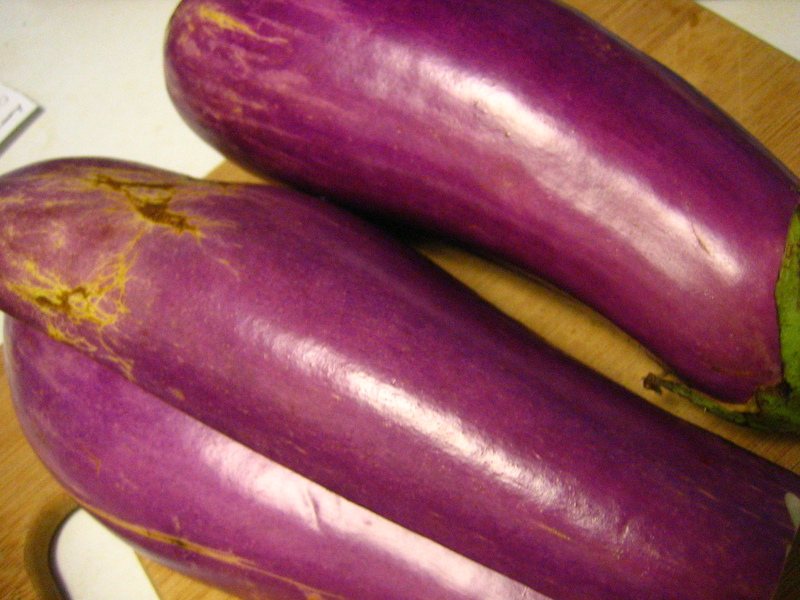 Slice the eggplant in half lengthwise, run with olive oil, and pace, face up on a baking sheet. Roast at 350 until soft, flipping over once. Meanwhile, make the parsley pesto: combine garlic, parsley, olive oil and up to ¼ cup parmesan cheese in a food processor. When the eggplant is close to done, make a box of pasta. Take the eggplant out of the oven and let cool while you drain the pasta and return it to the pot. Drizzle with olive oil, salt, and pepper. Bit by bit cut the eggplant and scrape it out of the skins. 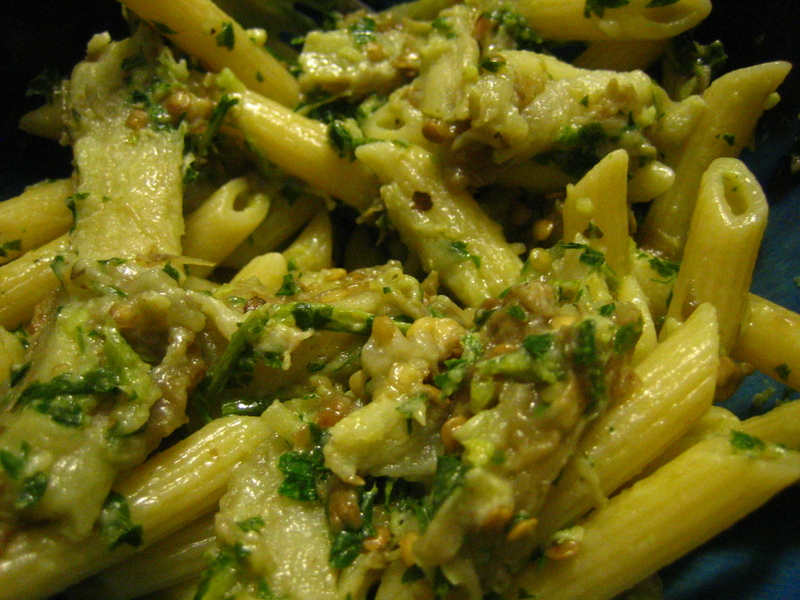 Add the eggplant and the parsley pesto to the pasta bit by bit, stirring constantly to combine. Add in ¼ cup goat cheese, stirring to combine and melt. Cover the pot of wonderful eggplant, cheese, pesto, and pasta and cook over extremely low heat for 2-3 minutes then eat. This completely life-changing roasted eggplant soup is adapted from Smitten Kitchen’s recipe, although we made a few notable changes. 2. Cut the eggplant, tomato, and onion into 1/2 inch thick slices and spread out on the baking pan. Peel the garlic and lay the cloves, uncut on the pan. Also add your slice of jalapeno pepper – but make sure you keep track of where you put it. 3. Roast for 20 minutes, then remove the garlic. Put the rest back in the oven, turn the heat down to 400 and roast another 15-20 minutes. 4. Remove the pan and put the onion, garlic, eggplant, and tomatoes in a soup pot. Remove the jalapeno completely – just the oil from baking it will be plenty hot. 5. Add the veggie stock to the pot and bring to a boil. Once it’s boiling, turn down the heat a little and cook until the veggies are all tender. About 10-15 minutes. 6. Blend the whole soup in a food processor until completely smooth, then return to a low heat. Add the cream, milk, and a little less then 1/4 cup grated parmesan. Cook, stirring often, for 5-10 minutes. Turn off the heat, sprinkle with fresh parsley, and eat with bread (and joy). A note about pictures: because this soup ends up a cooked-eggplanty brown color and is blended to be largely textureless, it is not super photogenic. Use your imagination and believe that it is worth the time and effort. Really. 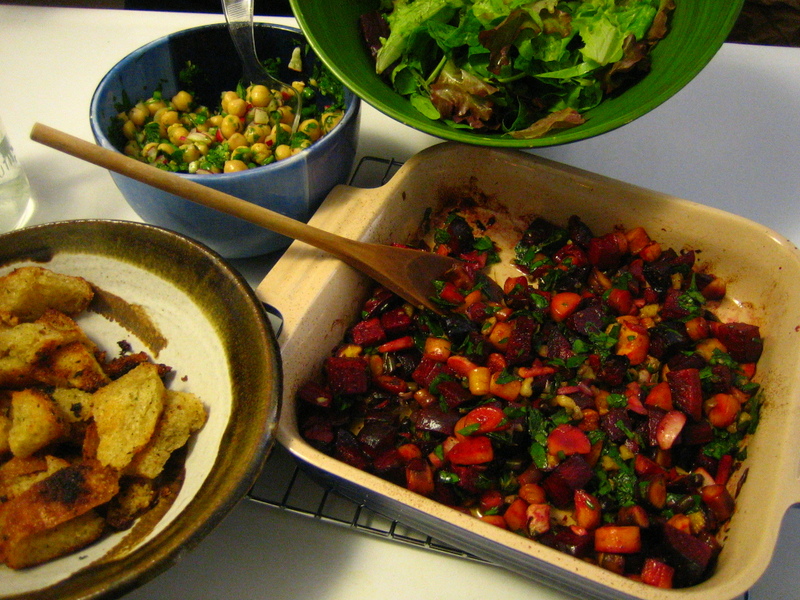 Tonight, a balsamic and parsley glaze over roasted beets, carrots, and turnips with a cilantro and chickpea salad. 1. Put the beets, turnips, carrots, onion, and scapes in an 8inch pan and toss with a little olive oil, balsamic vinegar, salt and pepper. 2. Roast at 400 until somewhat soft, not mushy. 3. While the veggies are roasting, combine the parsley, garlic/scape pesto, and walnuts in a saucepan. Add 1 1/2 tablespoons olive oil and a teaspoon balsamic vinegar (or more if you like). Cook over very low heat for several minutes then set aside. 4. When the veggies are ready, pour the glaze over the top, stir a little, and eat. 1. Chop up the cilantro, shell the peas, chop the radishes and garlic scapes, and slice the scallions. All of these things are optional except for the cilantro so mix & match to your heart’s content. Put it all into a bowl and add a tablespoon or two of olive oil. Add salt and pepper. Stir it together well and set aside. 2. Wash your salad greens and tear/cut them into pieces of a manageable size. (Librarian has a certain aversion to too-large salad greens, but feel free to skip this step if you’re not so inclined.) Put into big ol’ salad bowl. I like to add some salt and pepper to the greens and mix it all around a bit. 3. We mixed together the two parts of this salad (greens vs. cilantro/chickpeas/radish mix) individually, and added oil and vinegar to taste. Eaqual parts olive oil and butter, salt, pepper, slices of bread, cut or torn into small pieces. 1. Melt the butter in a frying pan with an equal amount of olive oil. 2. Mix in salt and pepper quickly. 3. Put the bread in and stir constantly over medium heat until crispy and delicious. 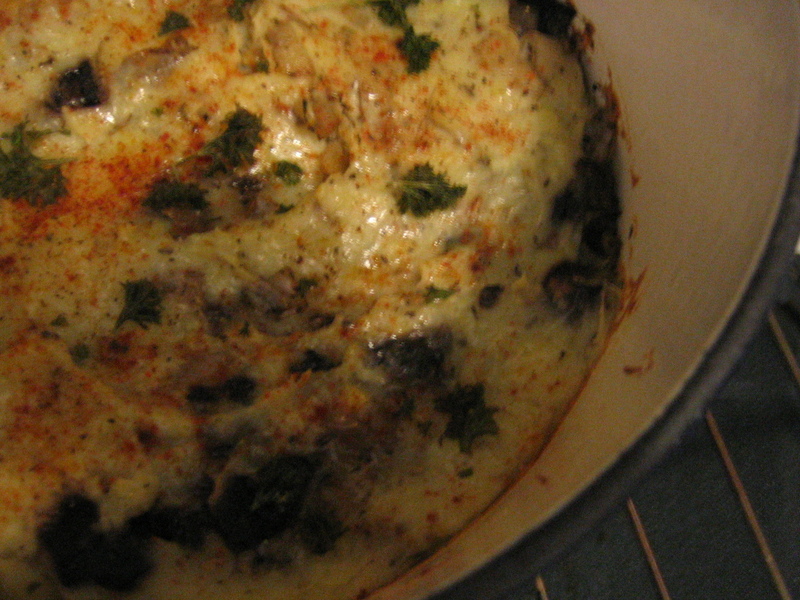 Whilst constructing a futon (care of our closet-dweller’s generous aunt), we also made this wonderful supper: Portobello-Layered Mashed Potatoes. This recipe was distributed by the folks who run our local farmers’ market and originally written by www.cookinglight.com. Place potatoes in a saucepan, and cover with water; bring to a boil. Reduce heat, and simmer 30 minutes or until tender; drain, reserving 1/2 cup cooking liquid. Mash the potatoes with a fork – keep some texture. Add reserved cooking liquid, milk, 3/4 teaspoon salt, nutmeg, and 1/8 teaspoon pepper, and stir it around until just mixed. Melt butter in a medium nonstick skillet over medium-high heat. Add onion and garlic, and sauté 2 minutes. Add mushrooms and cook 2 minutes, without stirring. Cook until liquid almost evaporates (about 4 minutes), stirring frequently. 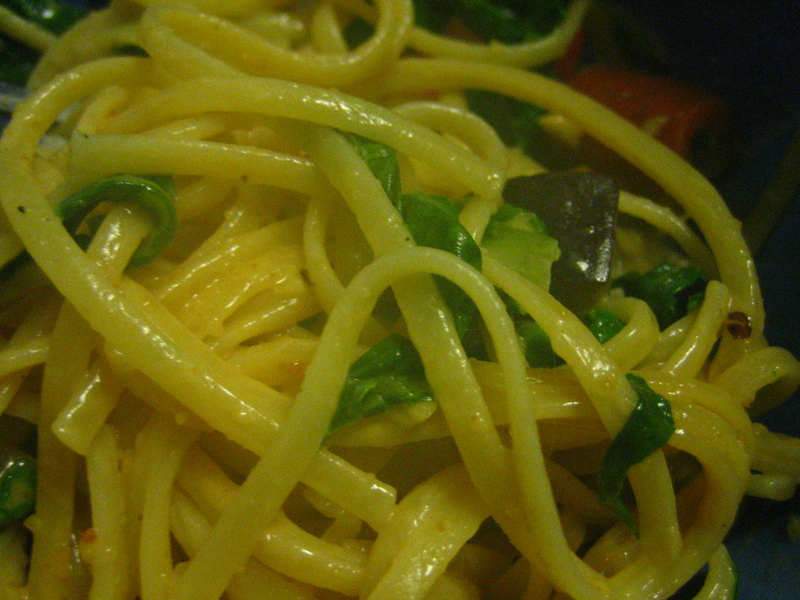 Remove from heat, and stir in 1/4 teaspoon salt, 1/8 teaspoon pepper, and basil. Spread one-third of potato mixture in bottom of an 8-inch square baking dish or 2-quart casserole dish coated with olive oil. Spread half of the mushroom mixture over potato mixture; repeat layers, ending with potato mixture. Sprinkle top with cheese and paprika; drizzle with oil. Bake at 375° for 25 minutes. We found that it needed extra salt and pepper, along with a bit of butter stirred into our individual portions. Faced with cans of chickpeas and little fresh food, I opened up one of my favorite cookbooks: Crescent Dragonwagon’s Passionate Vegetarian. This was my first vegetarian cookbook and I’ve been finding lots of great recipes in it now that I have consistent access to a real kitchen – it comes highly recommended! I came across her recipe for baked falafel, which at first glance seemed atrocious. Then I thought about the time and mess created by frying and decided to give the baked recipe a try. It was surprisingly tasty. Not at all the same as regular fried falafel, but worthwhile in its own right. 2. Place half of the chickpeas in a medium-sized bowl and mash slightly with a fork, potato masher, or your hands. (I used a round ladle to mash it at first, then finished off with my hands.) They should still have some texture when you’re done. 3. Place the other half of the chickpeas in a food processor with the garlic, egg, salt, cumin, pepper, tumeric, coriander, and cayenne. Process until smooth, pausing several times to scrape down the sides of the bowl. Add the parsley and breadcrumbs, then process until it’s smooth. 4. Combine the mixture from the food processor with the mashed chickpeas and the soaked bulghur. Stir it around until it’s evenly mixed. Taste and add more spices as you like. Stick the bowl in the fridge for at least 30 minutes, more if you have the time to wait. This allows the mixture to firm up a bit and will make your life easier vis a vis shaping the falafel. This waiting period is a great time to whip up some tahini sauce (see below), tdzaki, or whatever you like to eat with falafel. Plain yogurt works fine! Also, five minutes before pulling out the batter from the fridge, turn on the oven and preheat to 350F. 5. Remove the falafel mix from the fridge and grease a baking sheet. 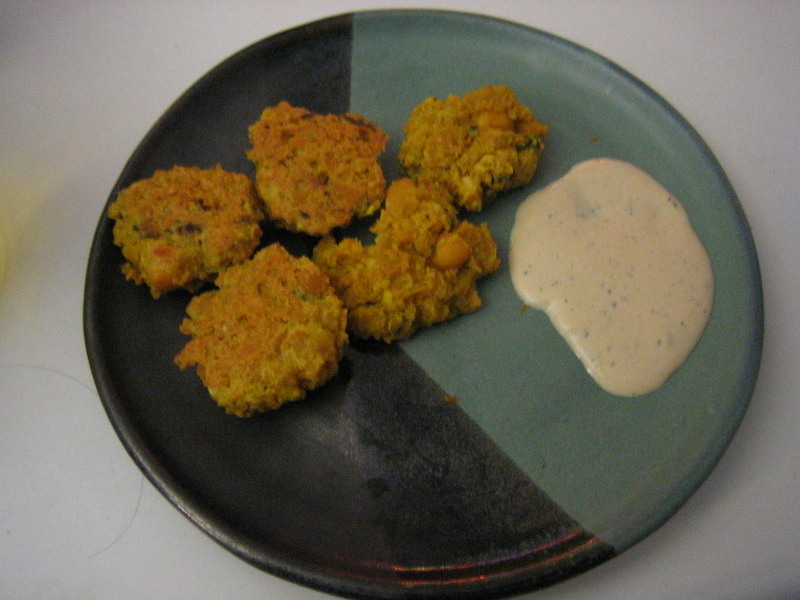 Shape the falafel mix into slightly flattened disks. We made about 25 that were about 1-1/2″ in diameter. Bake for about 25 minutes (we found that it took about 35, even with our usually hyperactive oven), then flip the falafel over and bake for about 5-10 minutes. They should be nice and golden brown. Thanks to Mark Bittman for the recipe! Excellent with falafel, or greens, or pretty much anything. 1. Put the tahini, coconut milk, lemon juice, garlic, and cumin into a food processor. Add some salt and pepper. Process until smooth. 2. Taste and add more spices, lemon, coconut, etc. until you like how it tastes. Serve immediately or cover tightly and refrigerate. Here in the hinterlands, we got another good foot of snow last night, and it’s begun blowing and flurrying again tonight. 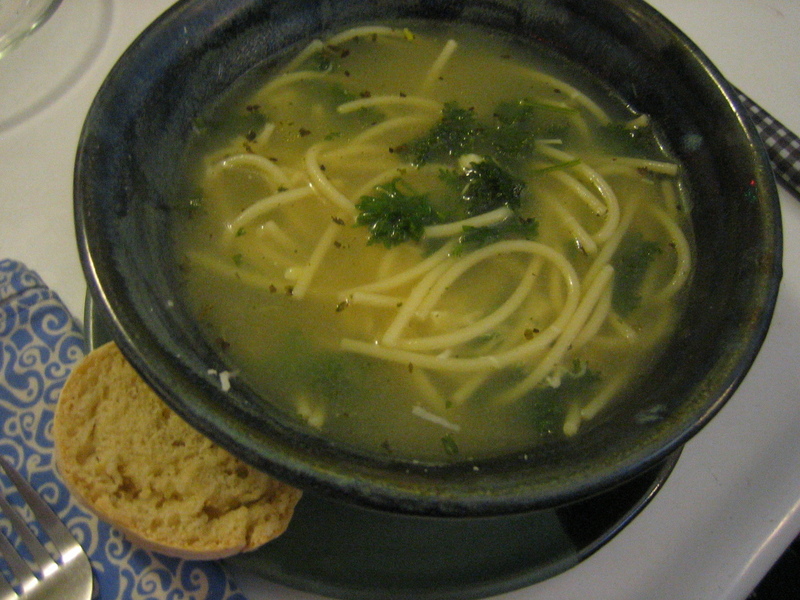 We’re cozying up and dosing ourselves with a heady combination of hot toddies, garlic and parsley soup with noodles, and a particularly inspired homemade crusty French bread. Followed by a rousing game of scrabble and some cheerful bluegrass—and okay, for one of our roommates (hint: the one who lives in the actual closet) “bluegrass music” also means some freakin’ Dixie Chicks. If this sounds like a recipe for perfect bliss, friend, it is. We’ve been inspired by the towering success of the bread to begin a weekly series of blog posts, each attempting a different bread from Mark Bittman’s How To Cook Everything Vegetarian. Below you’ll find the recipe for the spicy, light soup, and some helpful hot toddy hints. Take one into the hot shower with you (it is not weird quoth the closet-dweller) after the cold, snowy walk to the liquor store and you’ll feel you’ve died and gone to heaven. And now, for an anecdote as the cherry on this Wednesday sundae: We are three fairly liberal gals living in a very conservative enclave. Today this was all turned on its head with a choice comment made by our salt of the earth neighbor, a dispenser of advice on dog-walking, sprained-ankle-healing, snow-shoveling, and truck-moving who is naturally named Bob. One of our gang happened to be tramping into town past Bob’s house, where he was indeed heartily shoveling snow, with a troupe of snow-day-addled and rosy-cheeked children. Bob took one look at our harried compatriot wrangling a small herd of children through the snowdrifts and cheerfully exclaimed, “You need me to give ya the number for Planned Parenthood?” And thus, an ever-so-slightly scandalous joke about birth control made our night. We’ll take what we can get! The classic recipe is a tipple of whiskey (Irish, American (i.e. bourbon) or Scottish (i.e. scotch) a slice of lemon, and the rest of the glass filled with just boiled water. Variations include throwing some tea into the mix, and milk and sugar if the spirit moves you, though dairy and alcohol might just throw you for a nasty loop in quantity. 1. Cut at least two heads of large garlic. 3. Add eight cups of water or broth. Bring to a boil. 4. If using water, add at least two vegetable bouillon cubes. 5. Add a teaspoon each of dried basil, oregano, garlic powder, and salt. 6. Once the bouillon has dissolved turn the heat down a bit. 7. If you want, add a few handfuls of uncooked pasta. It will cook in the soup. 8. When the pasta is done, turn off the heat and add at least half a bunch of parsley. We used frozen parsley from this fall, but fresh would work just as well. Serve with delicious bread and parmesan if you want.